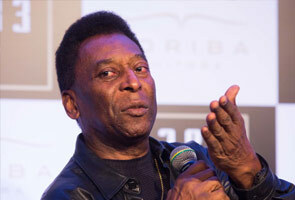 Brazilian football legend Pele penned a song to cheer on his country in the World Cup 2014 tournament. BRASILIA: Football legend Pele has written a song to cheer on his native Brazil in the World Cup as it prepares to host the June 12-July 13 tournament. "It's given me so much happiness, it's made me cry, football is in our nation's veins," goes the opening verse, which Pele sang to journalists from newspaper Folha de Sao Paulo. The three-time World Cup winner said "there needed to be a Brazilian song" after the release of the official tournament song by Pitbull and Jennifer Lopez and another Cup theme song by Ricky Martin. "I heard the one by Ricky Martin but I didn't like it," he said. The other songs "don't recall the difficulties" that teams go through, he said, calling on Brazilians to support the "selecao" through good times and bad. "My song is to tell people not to boo the team," he said. Asked if that meant he thought the hosts were in for a rough ride, the 73-year-old said he did not think so but that "Brazilian fans are very demanding." "Our defense is strong, now we just have to fine-tune our attack," he added. He refused to divulge his song's name, but said he had already begun recording it and expected to release it in the coming days. Amid fears the World Cup could be disrupted by recent demonstrations against the more than $11 billion being spent on the tournament, Pele also defended the right to protest peacefully but called on Brazilians not to take their frustrations out on the team. "There definitely have to be complaints, but take them to the politicians," he said. "Political corruption, cost overruns at stadiums, the players don't have anything to do with that, it's not their fault." He said his dream final would be Brazil against Uruguay, giving the hosts the chance to get revenge for their humiliation by their South American neighbors the last time they hosted the World Cup, in 1950.